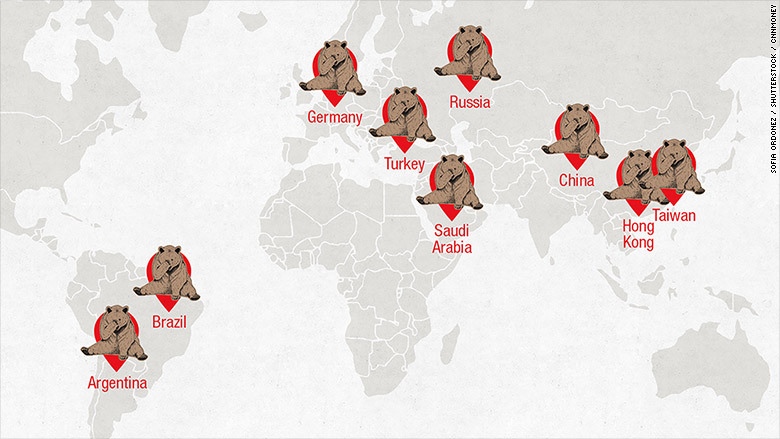 China's stock market crash has pushed markets around the world down sharply, tipping some into the so-called bear market. The term is used loosely and usually describes a sustained drop of 20% since the last peak. Some analysts believe a market must stay below 20% for at least two months. This is the one traders freak out about the most. The benchmark Shanghai Composite has now crashed 42% from its June peak. And it keeps sliding despite Beijing's attempt to prevent further losses. Behind the turmoil is the fear that China's economic growth is weakening. Chinese factory activity tumbled to its lowest level in more than six years on Friday. Russia is suffering due to tumbling oil prices and economic sanctions imposed on Moscow over its role in the crisis in Ukraine. Russia's main stock index, the RTS, has dropped 40% in the last 12 months. The country's economy is expected to contract by 3.4% this year and the ruble has hit a fresh six months low last week. Saudi stock market entered the bear market over the weekend, dropping more 20% since its peak in April. The OPEC leader has been hit badly by the collapse in oil prices -- it has recently announced it would start borrowing money to plug the hole in its budget. Oil has dropped from over $100 per barrel to just under $40 in just a year. Brazil is another market that's suffering due to its deep economic problems. It has been hit by low commodity prices, because its economy is partly dependent on its exports of oil, coffee beans and sugar. China is Brazil's biggest trading partner, so the current turmoil is adding to the misery. Argentina has plenty of problems, stemming from its $95 billion default in 2001, the largest by any country ever. It is now suffering even more because of the turmoil involving its two biggest trade partners -- Russia and China. Hang Seng, Hong Kong's main stock index, has slipped more than 24% since its peak in April. The market tipped into the bear territory on Thursday, following China downward. Taiex is another major Asian market to have slipped into bear markets last week, along with Indonesia. Malaysia, Singapore and Thailand also hovered near the 20% drop benchmark, but manage to rebound. Turkey is another developing country suffering because of the recent turmoil. Turkey is dependent on foreign investment. But as many other emerging markets, it has experienced huge capital outflows in the recent months. It is also plagued by political uncertainty. The country will hold its second parliamentary election in just six months in November. It's debatable if Germany belongs in the bear market club because the Chinese crash tipped Germany's benchmark Dax into bear territory on Monday, but then it quickly bounced bank on Tuesday. The world's second biggest economy is a vital market for big German companies.